Premium Plastic Knorks® included in this set are full 7" dinnerware size. 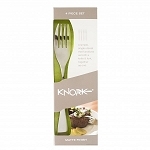 KNORK® looks like a normal eating utensil and attracts no attention when using it. Enables you to more easily cut food by using a rocking motion on the gently curved outside tines. Knorks are symmetric and can be used by both left-handers and right-handers.